In this part we will finish our survey of biblical reliability with a look at the books that are a part of the New Testament and why it is those books that are included. One of common criticism is that the New Testament is made up of the books chosen by a bunch of old white men in the 4th Century to push a competing agenda. As a result, other perfectly good books such as the Gospel of Thomas were excluded. In having this discussion, we are going to tie tightly into the last article on dating and authorship and go a bit further from there. First of all, these extra-biblical ancient texts are known collectively as the “Apocryphal New Testament.” Do not confuse this with what is known simply as the Apocrypha, which are the several extra books added to the Old Testament in the Roman Catholic Bible. While there are several groupings of the Apocryphal New Testament that includes a variety of acts, gospels, letters, etc., I generally divide it into two groups: the Gnostic gospels and everything else. The reasons for this will become clear as we proceed. In fact, I will start with the “Everything Else” books first, since they are the quickest and easiest to address. These include various Acts, such as the Acts of Peter. There are a variety of Apocalypses such as the First and Second Revelation of James. There are a great many gospels, probably the most well-known include the Infancy Gospels. If you read my last article, you will remember that I noted that there has been an effort by skeptics to push the dates of the canonical gospels back into the second century when possible. Part of the reason is that these additional books all date from the second (typically late second) through the fourth centuries. This makes it much easier to question canonicity. If you read through some of these works, however, you will find that the styles have clearly evolved and that legend has clearly been introduced. Consider the Infancy Gospels, for example. These texts attempt to fill in the lost years between the birth narratives and the beginning of Jesus’ ministry. They do borrow extensively from Luke and especially Matthew. In these texts you will find such things as the boy Jesus creating seven small birds to sing for him or curses the boys who were teasing him. You will find Him lecturing and correcting His father. Stylistically and in content they have nothing in common with the canon. They are clearly works of fancy that go so far beyond even the hint of the miraculous. While there was a strong Gnostic influence to these works, they were still popular amongst orthodox Christians. Essentially, they were the pop-fiction of the day. “A peasant had a girl who was a virgin. She was also his only daughter, and therefore he be sought Peter to offer a prayer for her. After he had prayed, the apostle said to the father that the Lord would bestow upon her what was expedient for her soul. Immediately the girl fell down dead. That example is pure Gnosticism and is quite contrary to the teaching of the canonical New Testament. So why such an effort to connect the New Testament with such questionable works? On the one hand, doing so obviously attempts to weaken the authority of scripture. More importantly though, by narrowing the gap with these other works it makes it easier to consider the body of works called the Gnostic Gospels and specifically the Gospel of Thomas. Most readers that don’t follow apologetics are probably saying, “Wait, there isn’t a gospel called Thomas in the Bible. Where did that come from?” Glad you asked. According to conservative scholarship the books in the New Testament date to not only the 1st century, but to living memory of the eyewitness accounts. The Gospel of Thomas dates to the mid to late 2nd century. Unlike the other gospels, Thomas does not have any case for apostolic origin. Moreover, when reading the text, it becomes clear that this book is also of Gnostic origin. So why would anyone want to include this book with the Bible. Simply put, including Thomas both weakens the authority of the New Testament and encourages questioning of orthodox Christianity. Opening the door with Thomas also opens the door for the other Gnostic gospels – of which there are several – and now there is an avenue for skeptics to legitimize that heresy as a viable alternative to orthodoxy. This discussion raises an even more important question. While we have been discussion why certain books are not in the Bible, it is even more important to ask why are the books that are in the Bible there? A lot of skeptics like to talk about this question as being decided by a bunch of old men at the end of the 4th century. The reality is that couldn’t be further from the truth. It is a popular myth that the canon was confirmed by the Council of Nicaea in A.D. 325. We’ll see that his is not quite true. The Old Testament is the quickest to answer. The Christian OT is the same as the Jewish Tanakh, the Hebrew Bible. Its content had been settled by the Jews centuries before Christ. There were a few important principles for the New Testament. For the Gospel, the requirement was one of Apostolic origin. In the case of Mark, it is referred to Peter and Luke, likewise, to Paul. Another criterion is that of living memory. All the books in the canon originate within the memory with the eyewitness. We have mentioned this earlier while discussing the Gnostic Gospels but it is worth mentioning again as an important distinction between NT scripture and non-scripture. and regard the patience of our Lord as salvation; just as also our beloved brother Paul, according to the wisdom given him, wrote to you,  as also in all his letters, speaking in them of these things, in which are some things hard to understand, which the untaught and unstable distort, as they do also the rest of the Scriptures, to their own destruction. The first passage is from Deuteronomy. However, the second quote is from Luke 10:7. Paul’s writings were collected around the same time. By the time of Origen in 185-254, scripture was certain with the four Gospels, the 13 letters of Paul, Acts, 1 Peter and 1 John and Revelation. There was still some dispute about the remaining books, as well as a few others, for example the first letter of Clement. Note that none of the books in dispute were Gnostic in nature! In fact, the heresies we’ve been talking about made it all the more important to know which books were true scripture. That is why there were efforts so early in church history. Also remember that it was only in these few final books that there was ever any real question. By the time of Nicaea in 325, the consensus regarding NT canon seems to have been largely – though informally – settled. In 367, Athanasius, the Bishop of Alexandria referred to our exact list in his famous Easter Letter. The first known council to declare this canon was the Synod of Hippo in 393. We have no records from the council, but reference is made to it in the Council of Carthage in 397. The important point of this travel through history is that all of the key canon of the New Testament was determined very early in church history. Some even during the time of the apostles. All the later councils did was to affirm what had been long accepted. It is also worth noting that no other collected works in the history of man has undergone such extensive scrutiny to determine its content and authenticity. At the end of it all, we can have a very high degree of confidence that the Bible we have today has been accurately transmitted through millennia. Moreover, we can be confident that it represents the content that God wanted man to have as his Holy Word. In the short space I have here, I have barely touched on this subject. The references I’ve provided elsewhere tackle this subject in much more detail. Especially take a look at Josh MacDowell’s Evidence That Demands a Verdict as a reference. It not only provides information on its own, but has extensive cross-references. Next time, I will conclude this series in a final essay on the historicity of Jesus. Yes, believe it or not, the fact of whether or not Jesus actually lived is (once again) being questioned. You said these books were added to the Ronan Catholic Bible this is grossly inaccurate. Those books were part of the original Canon and remained so until they were removed during the reformation in the 1500’s. NOTHING WAS ADDED. I spent many years as a Baptist believing this lie and only when researching on my own did I learn this was not true. Books were removed NEVER ADDED… and strangely the books removed were done in accordance with changes in Jewish text which sought to remove passages that were undeniably markers for Christ as the Messiah. Had Jesus carried a Jewish text it would be the same one found in the Bible the Catholic Church compiled over 1500 years ago and still uses today. I have not read this series in its entirety, just clicked this link, but if something so foundational is off I would be hard pressed to move forward. Is this a simple error, a mistake or do you actually believe they were added? Historically the Bible, the Roman Cathomic Bible has remained unchanged since the Catholic Church compiled it. It is copyrighted and cannot be altered or reinterpreted the way thousands of other bible editions are. Those texts are Sacred, Inspired by God inerrant and guarded over the centuries with lives of the martyrs. Nothing was added only removed and only removed by Protestants from the Old Testament. To suggest that it wasn’t gotten right until 1500 years later is not only tragic but imagine what you are actually saying? The entire church was spread across the globe – the Gospel was spread everywhere and it was done so with errors in the foundational texts?? Is that really an argument for Christianity? It actually is the best argument against Christianity. 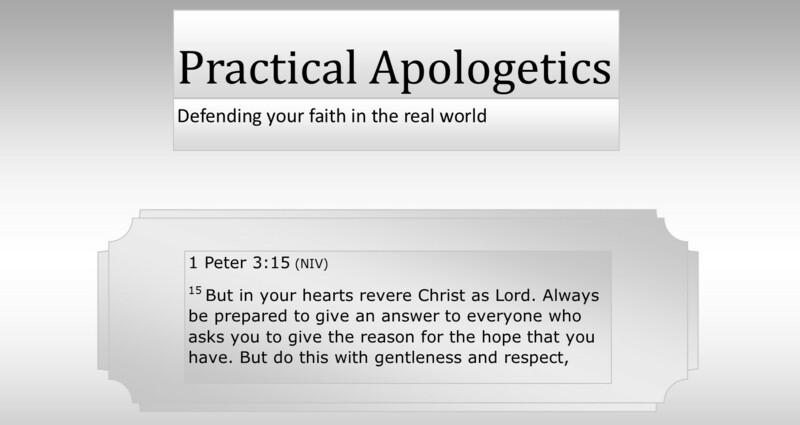 Apologetics is a critical component of Christian evangelizing, it need not be divisive when conducted in the light of historical accuracy. Doctrinal differences, methods of worship and practicing of faith are divisions in the Body of Christ, His Church, His Bride and every one of them is a victory for the enemy.